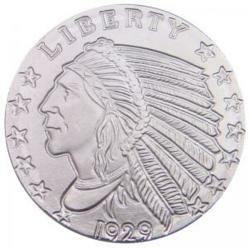 Liberty Coin & Precious Metals offers low price fractional silver coins at nearly 20% less than other retail precious metals dealers. Take advantage of these excellent silver coins before the dollar loses more value. Liberty Coin & Precious Metals now offers Fractional Rounds! At the request of numerous customers, Liberty Coin & Precious Metals, located in San Diego, CA, now stocks fractional silver coins. These coins offer protection against inflation and hyperinflation now threatening the global economy in the face of economic uncertainty. but with investment grade purity. Many experts are predicting a possible currency collapse involving the US dollar. In such an event, it is highly advisable that individuals have alternative forms of money. Historically, silver and gold have offered one such solution times of economic crisis. That's why pure silver in fractional form is the way to go. The coins come with the classic Indian Head gold coin design on the obverse and reverse, with "one troy ounce" stamped into the reverse. They are easy to store and highly valuable. Many people consider the junk silver to be an excellent option in the event of a barter situation, and surely so too could these fractional rounds be considered such. For a short time, Liberty Coin & Precious Metals is happy to offer our customers these fractional coins for only $1 over spot. This price makes these coins a low-premium yet investment grade silver coin, excellent as a store of value or investment.